I’m one of the bloggers participating in The Canadian Food Experience Project, a national program that’s helping to identify (or at least add clarity to) a Canadian food identity. It’s a fun program that has been making me stop and think about what makes some food distinctly Canadian. 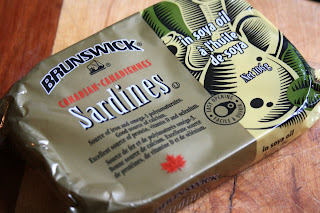 This month’s task was to write about a regional Canadian food. I'm from Southern new Brunswick, where the province reaches along the cliffs and beaches of the Bay of Fundy, home to high tides and spiralling herring weirs. It's here that for generations fishermen have been catching sardines, juvenile North Atlantic herring. For over 100 years they have been canned by Brunswick , a local processing company that ships them around the world. I just returned from a holiday in France where sardines are revered and where canned sardines from Brittany (where I was visiting) can fetch a hefty price. Here in New Brunswick we eat them on crackers as a snack or a lunch, an everyman's meal and well-priced at that. I'd say we appreciate our sardines, but we take them for granted. Michael Pollan, in his book Food Rules says "Eat the little fishes" and sardines are one of those "little fishes". They're full of healthy omega-3 essential fatty fats. 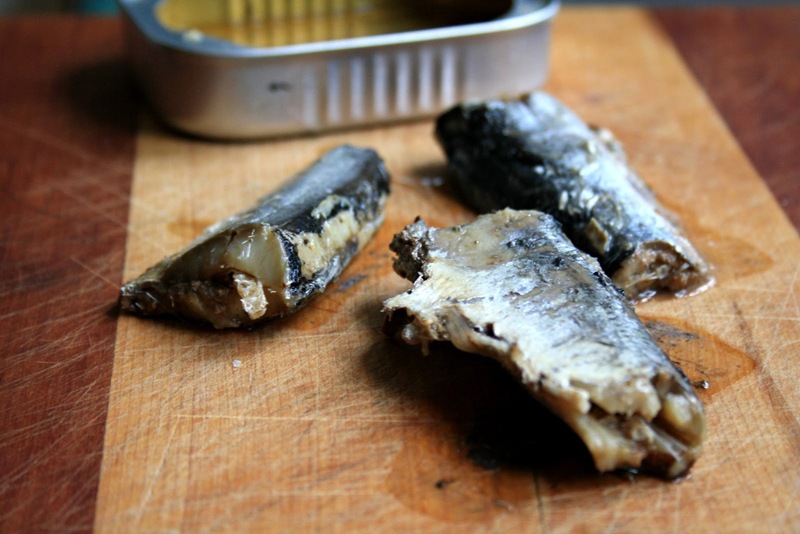 Sardines have a strong-ish flavour and a velvety texture. I love to toss them with pasta, capers and lemon but after enjoying a delicious lunch in Brittany last month that featured pesto-grilled sardines alongside new potatoes I got some new ideas. Ah potatoes, another regional favourite. We can thank the McCain family for putting New Brunswick on the Canadian potato map, nestled Florenceville, in the potato belt of Western New Brunswick. More than 50 years ago they started their French fry business and never looked back. Prepare pizza dough according to recipe below. Rub potato slices with 1-2 tsp. olive oil and spread on a parchment-lined baking sheet. Season with salt and pepper and bake at 350 F until soft, about 10 minutes. 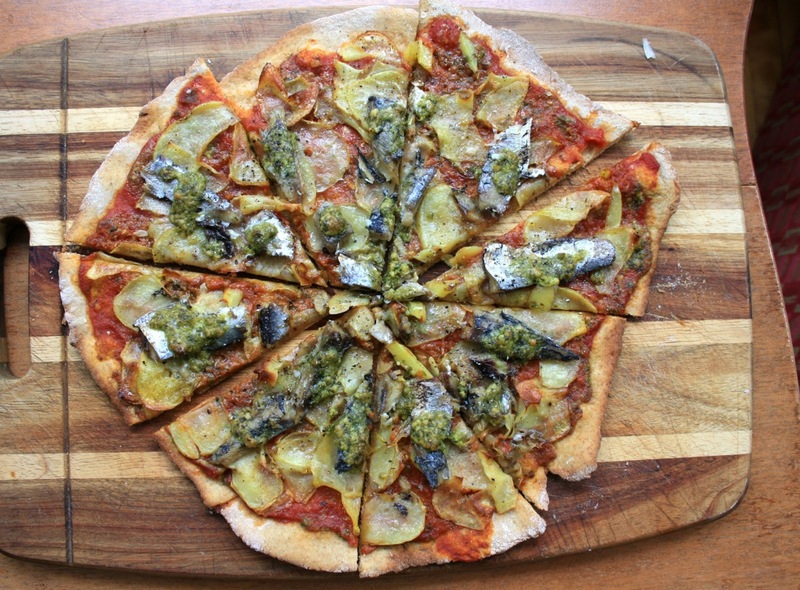 Roll out pizza dough, top with tomato sauce, then potato slices then sardine halves. Top each sardine piece with pesto and sprinkle over cheese. Bake for 12-15 minutes, until crispy on the edges. This is a slight adaptation of a recipe from a friend that can also be used to make an Italian loaf. In a small bowl dissolve sugar in water and sprinkle over yeast. Set aside for about 10 minutes until it starts to bubble. In a large bowl combine 1 cup of the flour with cornmeal and salt. Add the oil to the bubbling yeast mixture and pour over the flour. Mix well and begin adding the rest of the flour about ½ cup at a time until you have a nice doughy consistency. You might be left with ½ a cup or so of flour that you can’t stir in. Just sprinkle it on the counter and knead it into the bread. Shape dough into a ball and place in a lightly greased bowl covered with a tea towel. Let rise until doubled, about 1 hour. Punch down the dough and divide in three equal parts. Roll each piece into a 12” circle, add your toppings and bake at 400 for 10- 15 minutes, depending on how crispy you like it. 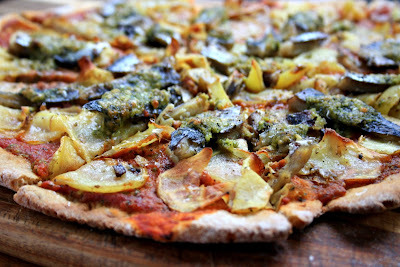 What a novel recipe for pizza, yet - so common on flatbreads neat the sea close to Genoa and throughout the Adriatic. This is a must try adventure for me... fresh anchovies are my favourite, though.